A £15 million loan for a Hilton hotel at the new Fletton Quays development site is vital to safeguard the city’s finances, it was claimed. During a heated debate between city councillors, the ruling Conservative administration said profit from the loan will help protect services in the face of stringent cuts to its budget from the Government. However, the Tories were accused of having the wrong priorities and were urged to instead spend the money on building homes. He added: “There are risks yes, but we are mitigating these. I would emphasise Hilton Hotels introduced this developer to us. The two-year loan will fund the hotel’s construction on the South Bank. The council has said it will borrow the money at a “very competitive rate” before then lending it to Norlin Hotels Holdings Limited which would pay a higher rate of interest to the council at the end of the two-year period. The loan will be secured against the land and the building and the amount loaned would never exceed the value of the site. He questioned where the potential impact of Brexit - such as the cost of labour or cost of materials rising - had been factored in. He added: “There’s a degree of overconfidence in the administration - I find it quite embarrassing. You find money for projects such as this to play Monopoly on Fletton Quays. “I think this calls into question the priorities of this council. We should be looking at making vulnerable people’s lives better. Labour group leader Cllr Ed Murphy said the deal was too good to be true and would put the council’s finances in jeopardy. But there was an equally passionate response from the Conservatives. Former council leader Cllr Marco Cereste, alluding to the budget deficit the authority faces from April 2018, said: “I’m so confused about what I’m hearing from the opposition. We are looking at a deficit of around £20 million next year. “I do not think we’ve heard of Santa Claus waiting in the wings to bring us £20-25 million to look after our citizens. “Unless all of us get our fingers out we are going to have to start making cuts which nobody in this room will tolerate. “When will you all grow up? We will make half a million pound profit. 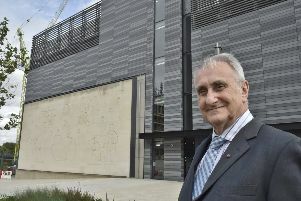 Current council leader Cllr John Holdich said: “This hotel is a high quality hotel and will make jobs. I would not put this forward to you if I thought it was a big risk.